Our first day on the road ended at the Tallahassee RV Park in, you guessed it, Tallahassee, Florida. This was a really nice park. We’ve never stayed here before but really liked the place. We even spent a while in the swimming pool relaxing and meeting new friends. We left Tallahassee with the intention of staying near Mobile, Alabama, since it would have been 2/3rds of the way to Lafayette, Louisiana where we planned on visiting friends. However, between an early start and gaining an hour from changing from Eastern to Central time zones, we decided to drive on and stop another hour or so later in Biloxi, Mississippi. 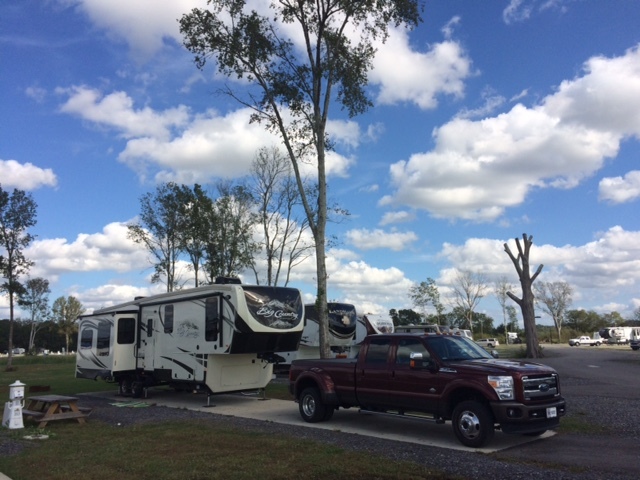 We’ve stayed at Cajun RV Park before, but this was the first time we’ve been in the area with the other longer-term trailers and not in the front part of the park near the road (and the go-kart track next door). We did a little bit of “touristing” and browsed the local beach shop (buying some postcards). 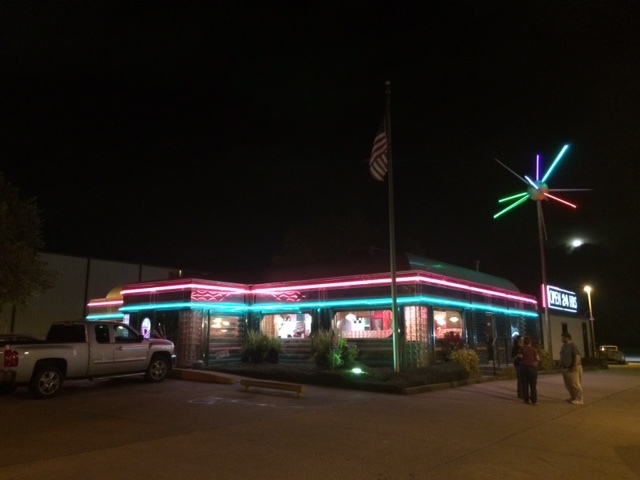 We also decided to eat at our favorite BBQ place in Biloxi – Slap Ya Momma’s. They had moved to a new place (used to be next door to the campground) just down the road. Today was an eventful day. The first event occurred when we were driving through Baton Rouge, Louisiana on I-10. A local police car was pulling over a speeding vehicle across several lanes of traffic. When the police car got into our lane, he slowed way down to almost a stop directly in front of us. We avoided rear-ending him and locked up our tires trying to slow down quick enough. Shortly after that fun incident, while descending the hill on the far side of the bridge over the Mississippi River, we heard a really loud bang. Malcolm looked in his side mirror to see a pickup truck that was passing us on that side swerving away from our trailer. Shortly after that, our tire pressure monitor started beeping and showed 0 PSI on the front, left tire on the trailer. We coasted the rest of the way off the bridge and pulled over to the side to assess damage. Fortunately, the tire held up well after blowing out a chunk of the sidewall. The tread stayed intact and we suffered no damage to the trailer. Malcolm set about changing the tire when a local roadside assist truck appeared. Though Malcolm had all the tools and everything he needed to change the tire, he did ask if the roadside truck driver would leave the truck there with his flashing sign on. He did and also set out cones to direct traffic away from us (we were at the end of an entrance ramp merge area). He also helped Malcolm with changing the tire and airing up the spare a bit. We drove on west to our scheduled stop in the Lafayette, Louisiana area. Part way between our roadside incident and our stop for the evening, we hit a milestone of traveling 100,000 miles with an RV since we started full-timing. This evening, we visited with our friends Nick and Sheila, taking them out to dinner for Sheila’s birthday. Our plan is to wait here until Monday morning. We hope to be able to get some new tires sometime on Monday. We may or may not be able to roll on down the road Monday, but hope to on Tuesday morning at the latest. The KOA here has reserved our spot for us (they are not full, surprisingly) through Tuesday at least. We’ll play it by ear depending on how the tire thing goes. After we left the Texas rally waaaaay back in the middle of March, we headed back east to Wetumpka, Alabama. The first night, Sunday, we stayed in Junction, Texas which wasn’t a very long drive (250-ish miles). We ended up hauling the remainder of the trip (a little over 1,000 miles) in two days, stopping the Monday night in Westlake, Louisiana and rolling into Wetumpka on the Tuesday around 4:00 in the afternoon (we left Westlake at the crack of dawn). We spent about a week back in Wetumpka. Malcolm ran into Montgomery on Thursday morning to get his tooth fixed. We relaxed in the area for several days, attended church on Sunday morning and Malcolm got a few days’ worth of work in. We rolled back out on Tuesday, the 28th, to start heading back to Louisiana for the Heartland Owners Club Louisiana rally, staying overnight in Biloxi. We pulled into the RV park here in Louisiana on Wednesday just after lunch. The growing cloud cover encouraged us to get everything set up. Several other rally goers were here already and we visited with them until it started raining later in the afternoon. That rain let up, but started back up in earnest overnight. We had some thunder and lightning and a lot of rain, but nothing serious. Thursday, Friday and today have all been pleasant and warm. On Friday morning, we all pitched in for a big breakfast. Malcolm went over to help cook bacon while Val stayed back at the rig to bake banana bread muffins and scones. We went out with friends for dinner on Friday evening before coming back to the park for an ice cream and cake meet and greet. This morning we were treated to fresh, hot beignets for breakfast. Malcolm enjoyed a couple but was having some stomach issues. He spent most of the day today inside the rig staying close to the facilities. After a nap this afternoon, he seems to be feeling a bit better. We didn’t get out and do any sight-seeing so he could relax. We’ll all be eating dinner around 6:00 this afternoon and will visit this evening. Tomorrow, we’ll say our goodbyes and head out. We’re going just down the road to Scott, Louisiana for an overnight visit and dinner out with our friends Nick and Sheila. From there, we’ll take two or three days to drive on back to our home in Florida. Let’s see, at last count in the blog, we were getting ready to leave our lot in Florida. Today, we’re in Texas. Allow us to recount the last several days for you. We left Florida on Sunday of this week and traveled the entire distance to Wetumpka to stay at Fort Toulouse. We ran errands there on Monday, including stopping by our storage unit and grabbing about eight totes and a shelving unit. We took those all back to the rig and packed them all into the basement of the trailer. We will stop back through on the way back to Florida after this current trip and pick up more totes and another shelving unit. We’ll use one of our storage sheds in Florida to put them all in. We’ll eventually release the storage unit we’re renting in Alabama once we clear it out later this year. We left Wetumpka on Wednesday, which was also our 31st wedding anniversary. Before hitching up the trailer to leave, we stopped by the local Dunkin’ Donuts to grab some breakfast. As we were driving around Montgomery, Alabama, we were passed by a pickup truck carrying a bed full of junk. An aluminum screen door laying on top of the pile blew loose and headed straight for our truck. Malcolm swerved away as much as was safe, but the screen door hit the truck and flew underneath where we ran over it with all the left-hand truck and trailer tires. We pulled over to assess any damage. The other pickup truck slowed, but went on up the road (they were actually going to the next intersection to turn back around and come back). We didn’t see any damage and headed on up the road, giving the pickup driver a thumbs up as we passed. We didn’t find the damage until we stopped for lunch. It’s pretty minor, just scratched paint on the front bumper. We’ll get some touch-up paint and fix it later on. We stopped for the night in Biloxi, Mississippi. We took care of some laundry but otherwise just relaxed in the trailer for the evening. Malcolm took the truck around the corner and filled the fuel tank. We left Biloxi on Thursday morning and headed to Westlake, Louisiana (near Lake Charles). On the way, the truck indicated it was time for an oil change and for new fuel filters. We stopped for the evening at Whispering Meadows RV Park, where our friends Andy and Joanna Grimes are currently staying. Andy brought their two dogs – Rowdy and Kaydee – down to our site to visit until Joanna got home from work. We invited Andy and Joanna to share our anniversary meal with us. They drove and picked a great restaurant for us. We had a great time. This morning, Malcolm headed out early to the Ford dealer to get the oil changed and fuel filters changed. They had him in and out in about an hour. He headed back to the trailer and we hitched up and rolled out by 9:00 in the morning. Today we drove from Westlake to Luling, Texas where we are currently staying for the night. We have two more days before we arrive in Alpine, Texas where we are meeting several friends for a rally sponsored by the West Texas Chapter of the Heartland Owners Club. We’ll be there all next week. We got busy and had fun traveling and visiting folks and let our blogging lapse once again. We’re sure it won’t be the last time. So, what have we been up to since we left our friends in Burleson, Texas? From there, we headed back down to Lake Conroe and stayed at the Lake Conroe KOA for an evening. From there, we headed back down to the Houston area then across I-10, stopping in Scott, Louisiana for two nights. While in Scott, we had dinner out with our friends Nick and Sheila. We dropped by their place and give them some anniversary gifts that we had found through the year while traveling. The next day we drove down to meet Nick and Sheila for lunch near Nick’s office. From there, we headed down to New Iberia and the Conrad Rice Company to pick up some rice and other items. We went to Nick and Sheila’s for dinner before heading back to the trailer to get ready to head out early in the morning. On Thursday, we were on the road by 7:00 am. We drove the entire 446 miles from Scott, Louisiana to Wetumpka, Alabama, arriving around 4:00 pm. We would have been close to an hour earlier except for a couple of long backups on the interstate. Our plan was to stay here in Alabama through tonight and head out tomorrow morning towards Clarksville, Indiana to our trailer’s selling dealer. We were scheduled for a wheel bearing and brake check as part of the (free) “Warranty Forever” program included with our trailer. We had also purchased another aftermarket extended warranty when we purchased the trailer, as well. When Malcolm called our dealer today to verify that we had an appointment on Thursday and that they would be able to get us in and out in a day, he didn’t get any warm fuzzy feelings from the service person on the phone, who indicated they’d “do their best” but he couldn’t guarantee anything since they only had two technicians scheduled to work that day and that they were pretty backed up. We made the decision to forgo the “free” warranty by not having the service done at the dealer. After looking at the costs to drive up to Clarksville and back, along with campground costs and the cost of the service, we would be out about $700-800. Definitely not a free warranty at that cost. So, we’re staying here in Wetumpka probably until mid-November. Malcolm will do the brake and bearing service on the trailer himself. So, now that we’re here for a while, we’ll be settling down so that Malcolm can work more or less full-time for most of the rest of the year. We will probably only travel from here to see David around Thanksgiving, then back here for the remainder of the year. This morning we hooked up early and left to head west to Louisiana. 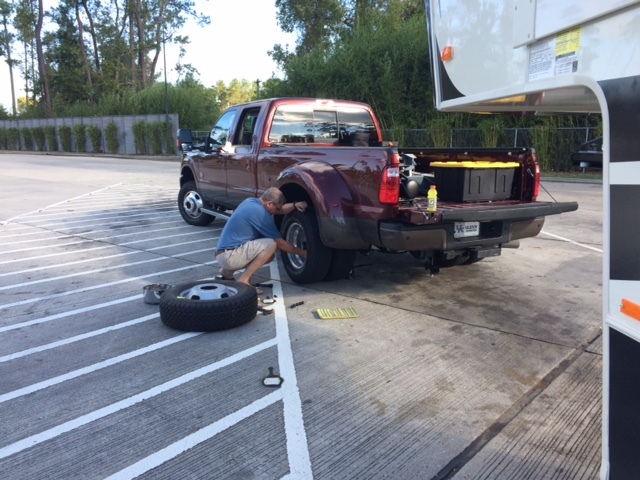 After we had been on the road a bit, Val noticed one of the tire pressure sensors (that we added to the truck and trailer) was showing low pressure on one of the inside dual rear wheels on the truck. We stopped at a rest area and Malcolm checked the pressure manually and found it to be about 10 psi low. He had some air still left in the air compressor tank and put in about 8 psi. Before leaving the rest area we watched as a couple more pounds of air left the tire. It then became tire changing time. We unhitched the trailer and pulled the truck forward. Malcolm dropped the spare and put more air in it (it was low from the factory) using his 12V portable compressor. We got the tire changed and the leaky tire up in the spare position, hitched up the trailer and headed on to Louisiana without further incident. We arrived at the Cajun RVera park around 2:00 pm and got set up near some of our Heartland friends (we are here for the Louisiana Chapter rally). We took the opportunity to finish spiffing up the inside, including a good vacuuming, for potential open house activity (everyone needs to see your new trailer, after all). 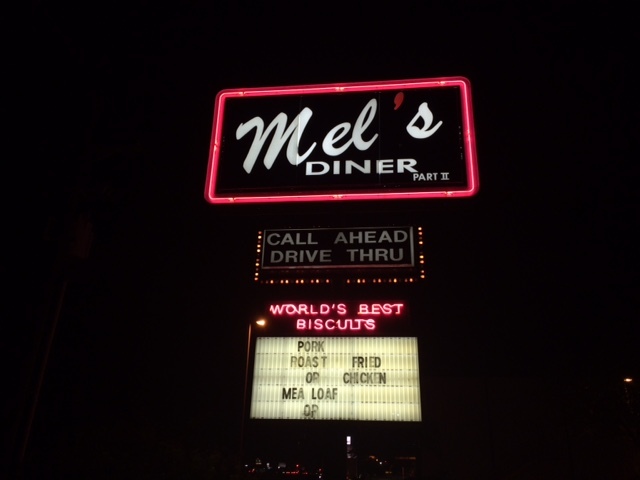 We spent the afternoon visiting others in the group before heading out to meet our friends Nick and Sheila for dinner at Mel’s Diner. It was a good dinner and we had a great time visiting for a couple hours before heading back to the trailer. 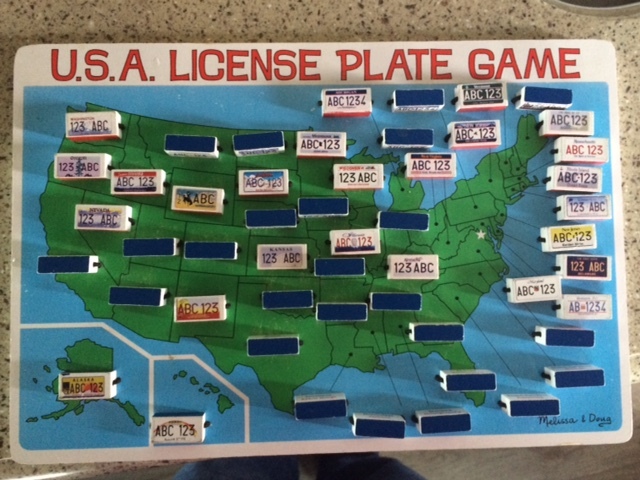 Today’s license plates – 25 of 51 found.